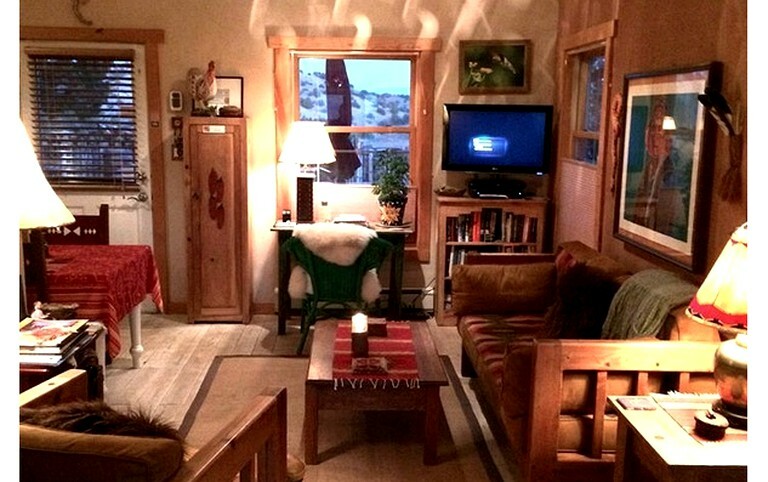 This artistic casita is located on a unique property near Santa Fe, New Mexico—complete with a private hot tub that is situated on an elevated deck on a hillside overlooking the Chama River Valley. From here, guests will be able to enjoy the area's local wildlife, big sunsets, and stargazing, all while soaking in the hot tub. The hot tub is located down a 200-foot trail from the accommodation, and its deck also makes for a great place to do yoga. The inviting accommodation is a northern New Mexico-style pitched tin roof structure, which is tastefully and uniquely furnished with an eclectic, southwest farmhouse style—including high pitched ceilings and rustic, whitewashed pinewood floors. The casita forms part of the north wing of the host's larger main home, but it has two separate front and rear entrances, which are both private. The hosts keep a very low profile and are only around when guests need something. All past guests have commented on how unobtrusive the hosts are. 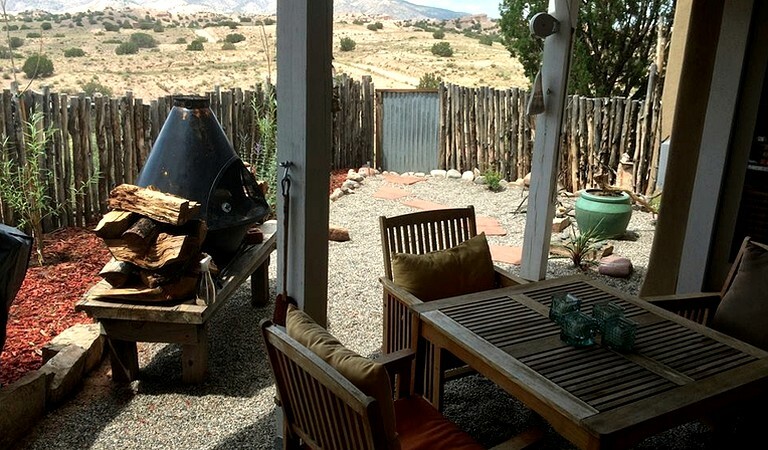 The casita is well insulated for sound, privacy, warmth in the winter, and coolness in the summer. 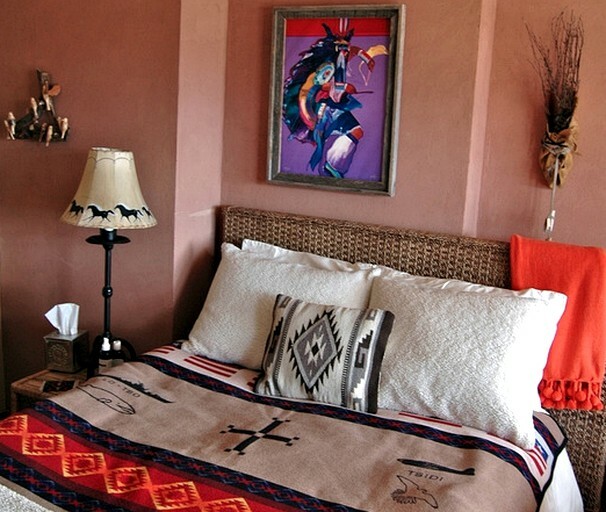 In the living room, guests will find comfortable, handmade Taos furniture and original, native local art and paintings. The living room opens up into the front courtyard's garden, where there are many bird and hummingbird feeders. There are many different species of birds that visit the property daily year-round. Moreover, the dining area is surrounded by big view windows, and the gourmet kitchen comes fully stocked, including breakfast provisions for the duration of the stay (included in the rates). 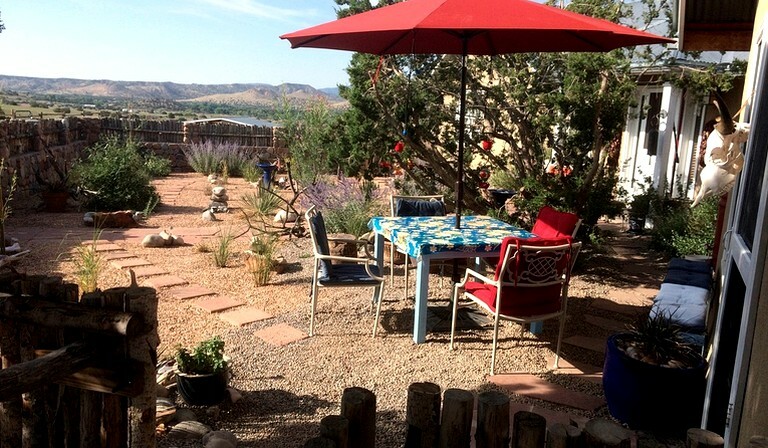 The property is very peaceful, and past guests have loved the solitude and sound of silence here. For those who will need access to "city necessities," the hosts provide the following: great cell phone reception; complimentary, high-speed Wi-Fi; unlimited phone calls with free long distance calling; a 40-inch flat-screen television with a Blu-ray player, a DVD player, DishTV satellite, and free Netflix. There is also a second television in the guest bedroom; a Bose Soundtouch internet radio and Bluetooth speaker (guests can connect their laptop, tablet, or smartphone with the Bose Soundtouch app). The sleeping arrangements include two bedrooms. There is a large master bedroom with a sitting area and a door to the outdoor covered sitting and sunset-viewing area. 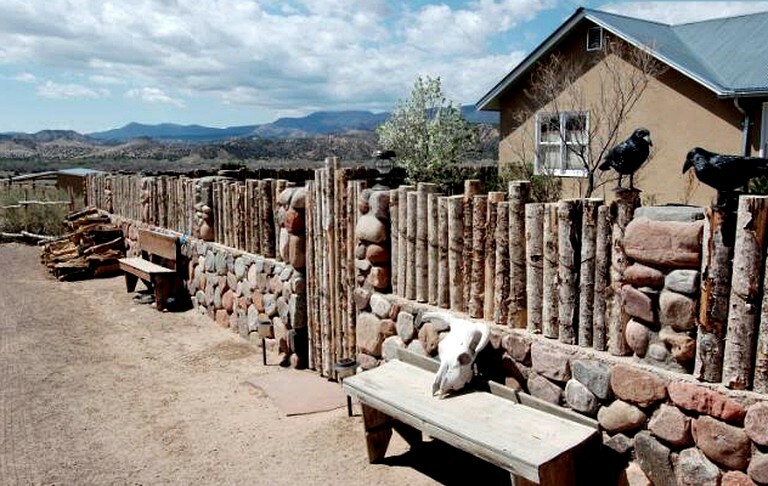 Guests will also find a large fireplace stocked with Pinon wood kindling. The high-quality queen-size bed has 600 thread count sheets, a fluffy down comforter, and lots of down pillows. In addition, the mattress is a fluffy, hypoallergenic feather bed that is topped with beautiful, colorful Pendleton blankets. There are separate heating and air conditioning, too. The second bedroom comes with a double bed and the same quality bedding as the aforementioned master bedroom. It also comes with a writing desk with great views; a television with a Roku player and a DVD player; a dresser and closet; and a book library. This bedroom also has its own separate heating and air conditioning. The full, private bathroom features a combination bathtub and shower, as well as organic soaps, shower gel, and lotions. The hosts provide fluffy towels and lots of extra bath provisions, in addition to a hairdryer. Additional guests can sleep on the living room sofa; the back and side cushions may be removed to make it into a twin bed, with plenty of extra sheets, pillows, blankets, and comforters. This room also has a television with a Roku player to stream Netflix and watch DVDs. In the laundry area, guests will find a stacked washer and dryer, and organic, non-toxic laundry detergent is provided. There is also a HEPA stand-up vacuum, a broom, a mop, and organic cleaning products. Breakfast is included in the stay, and guests will find the breakfast provisions stocked in the gourmet kitchen of the accommodation. Breakfast supplies include organic coffee beans (caffeinated and decaf) but there is a 10-day notice required for decaf coffee, as the hosts roast their own beans, in addition to assorted herbal and organic chai and teas; lemons; local Abiquiu honey; organic half and half; coconut and/or almond milk; organic jams and jellies; farm-fresh organic eggs; butter and cream cheese; three to four different types of bagels; artisan breads; pancake and waffle mixes; real maple syrup; steal cut and instant oatmeal; and a restaurant-style Belgian waffle maker. There is also cold bottled water stocked in the refrigerator. The hosts can accommodate guests with special dietary requests, including vegetarian, vegan, and gluten-free. 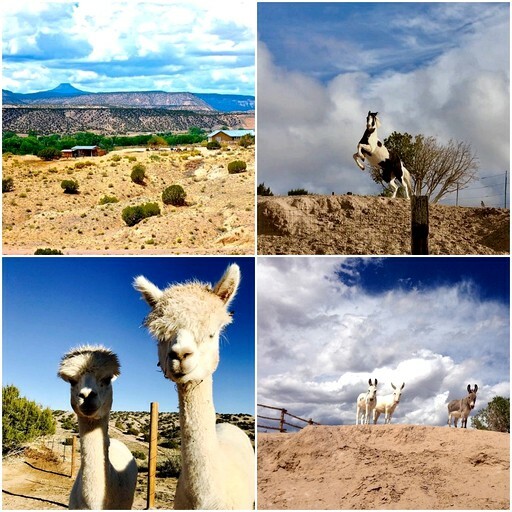 While on-site, guests can visit with the property's horse, mini donkeys, and alpacas. 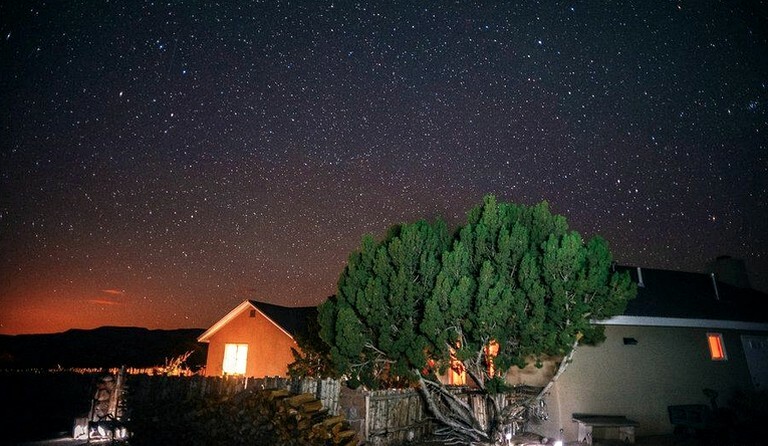 Right from the property, guests will also be able to enjoy fantastic stargazing and thunderstorm watching conditions, as there is no light pollution in this area. 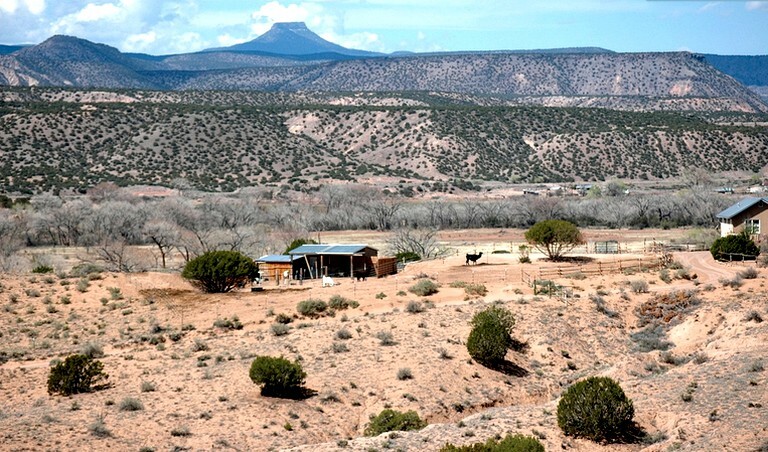 The property backs up to 1000 acres of BLM land that guests can hike or ride on, as well as miles and miles of riding and hiking trails from right outside the accommodation's front door. Guests will be a mere five-minute drive from Bode's General Store and Georgia O'Keeffe's home and studio tour. 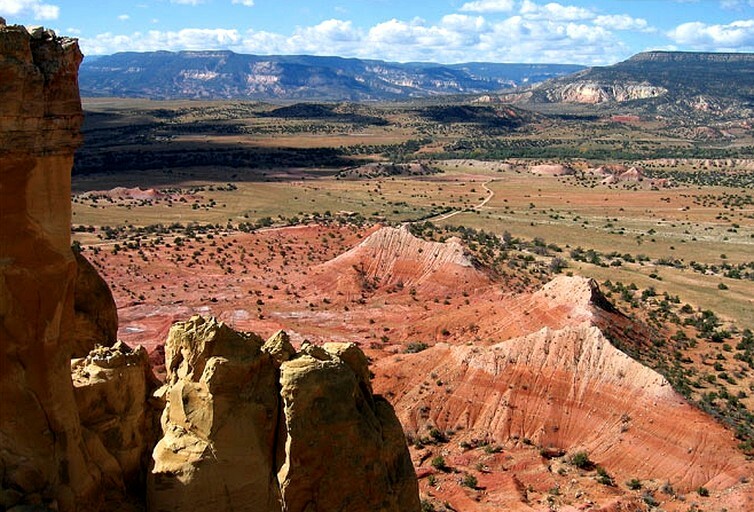 In addition, they will be only eight minutes to the incredible Plaza Blanca hiking area, 15 minutes from Abiquiu Lake, and 20 minutes from Ghost Ranch, with the best hiking in all of New Mexico. 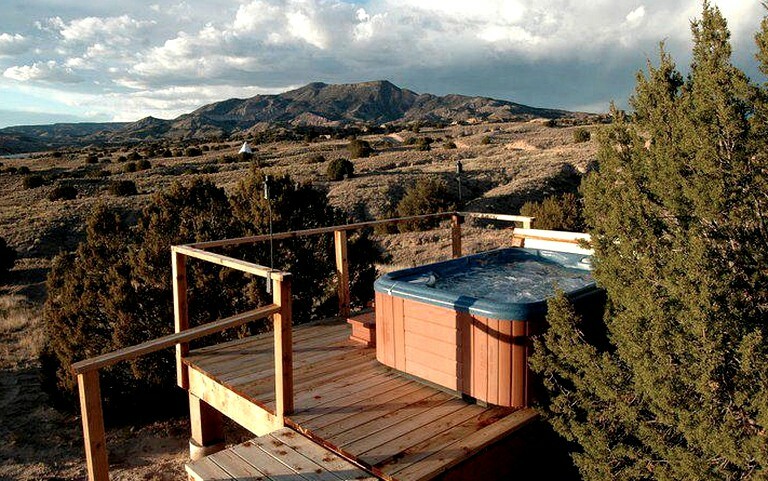 Glampers will also only be 30 minutes from the Ojo Caliente Mineral Hot Springs. Pets are permitted for an additional nightly fee; cats are not allowed, but smaller dogs under 30 pounds are welcome. Larger dogs will be considered, but guests must ask the hosts for permission. Dog bowls for food and water are provided. Pets can never be left unattended and must always be on a leash to avoid chasing wildlife. The accommodation is meticulously cleaned between guest visits, and the front and back courtyards are completely fenced-in by 4.5-foot fences with gates. Horses are also welcome for an additional nightly fee. Guests must provide their own hay and must feed their own horses. The hosts provide a paddock, a barn stall, and a one-acre turnout area, in addition to plenty of fresh water daily. Guests are required to clean the stall and paddock and will be provided with a manure fork and cart unless they would like to pay another additional fee. Early check-in is possible, as well as late check-out (for no extra fee).